We are committed to making this the cleanest, greenest borough in London but we need your help. 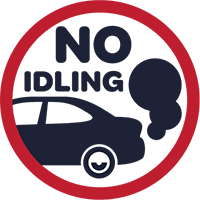 From 1 March, people who refuse to turn off their idling engines when asked will be fined. Car idling produces up to 150 balloons of exhaust emissions per minute containing harmful chemicals like cyanide, Nox and PM2.5 every minute. Did you know that the Royal College of Physicians say 40,000 deaths a year are linked to air pollution, with car idling being a contributing factor? Too much idling can damage your vehicle. There are several ways you can get involved in our campaign. Getting our children interested in and knowledgeable about air pollution will help spread the word to parents and other adults that idling their car engines is bad for their health and the environment. We are running a competition for primary and secondary school students in the borough to raise awareness about the importance of air quality with the opportunity to win £100 voucher to use in a local bike shop. Primary school children are being asked help design maps describing a 'breathe easy' route to school. These routes could include the best cycle routes, parks and open spaces, public transport, walking, in their community. We would like secondary school students to create a 30 second video or animation that the Council and local groups, organisations and schools can use on social media regarding car idling, encouraging drivers to turn off their cars. We are excited to see the creative ideas our children come up with and encourage you to share these with us via our social media channels and email. Complete our online form to pledge your support for our campaign. Thank you to all of the businesses who are supporting an idle-free Richmond upon Thames. Contact carol.lee@richmond.gov.uk for more information.